I don’t think it’s an understatement to say that I greatly dislike Bluetooth headphones. Regardless of what proponents might suggest and regardless of the advancements made to improve Bluetooth connectivity, it’s still significantly easier to just plug in a pair of headphones than to go through the oftentimes lengthy process of pairing headphones to a smartphone or Bluetooth-capable music source. All of this is to say that I’m a huge proponent of Bluetooth headphones that also come with a 3.5mm headphone cable — like the Libratone Q Adapt wireless on-ear headphones. Now that we’ve established that I’m a staunch critic of Bluetooth headphones, let’s get down to business: Libratone’s Q Adapt headphones are subtle and stylish. They also offer the added benefit of sounding great and working even when plugged into a headphone jack. The headphones come in two colour variants, ‘Stormy Black’ and ‘Cloudy White,’ and cost $329 CAD. That might seem like a lot — and make no mistake, it is — but the cost is almost justified. The earcups are made of a soft, supple leather material that comfortably conforms to the dimensions of the listener’s ear, while the headband is made of a sturdy metal, covered by a non-removable knit cloth material. I’ve found that the combination of the leather earcups and cloth headband means that the headphones stay in place — even during extraneous movement and exercise. In spite of the premium feel of these headphones, I’m afraid my first genuine bit of criticism stems from how uncomfortable the Libratones become during extended use. Maybe I just have a big head — maybe my ears are lopsided — but I found that I couldn’t use the Libratone Q Adapts for longer than an hour before experiencing the condition that I’ve taken to calling headphone-ear. In case you’re wondering, headphone-ear is the pain that results from wearing headphones for an extended amount of time. And that’s a shame, because the Libratones offer a deep, rich sound portfolio that pairs perfectly with almost any kind of music. Everything from Steely Dan’s ‘Deacon Blues’ to Childish Gambino’s ‘Redbone’ to Wu-Tang Clan’s ‘Bring Tha Ruckus’ to Jimi Hendrix’s cover of ‘All Along the Watchtower’ sounds crisp, clear and full. Especially noteworthy is that the headphones provide a delightful blend of treble and bass tones that doesn’t favour one particular clef over another. You definitely don’t need to worry about dulcet lyrics getting drowned out by the unceasing thumping of a sick beat. The Libratone Q Adapt headphones have been available since at least February 18th, 2017, but the box now features a notable sticker: Made for Google. What this means is that the headphones are able to connect to the Google Assistant to give listeners access to the digital assistant at the touch of a proverbial button. In the interest of full disclosure, I had absolutely no idea how to activate this feature and, for a short time, I actually thought that I’d need to update my phone or the Libratone app (yes, there’s an app; more on that later) to get it to work. See, I thought you pressed the action button to activate Google’s digital assistant. As it turns out, I simply misunderstood the instructions — you activate the Google Assistant by holding down three fingers over the right earcup. Once I figured out how to activate the Google Assistant, I found that it worked in much the same way as on a regular smartphone. I was able to ask for directions, search for addresses and phone numbers, and even send text messages. However — and this might simply be a matter of inexperience — I found that it was easier to send text messages using the Google Assistant on my phone rather than on the Libratone headphones. Aside from a few hiccups, it seems that Google’s Bisto experiment is working out quite well. Users can also tap three fingers to answer and hangup phone calls. Tapping with two fingers controls the play-pause functionality, while moving a single finger clockwise or counterclockwise increases and decreases the volume. However, there’s no fastforward or rewind setting, so you’ll need to pull out your music player to skip between tracks. The Libratones are noise-cancelling, and come with four distinct noise settings. The feature works quite well, and I can say that noise-cancelling is effective enough to drown out the blaring horns of a GO Train interrupting my morning podcast routine. 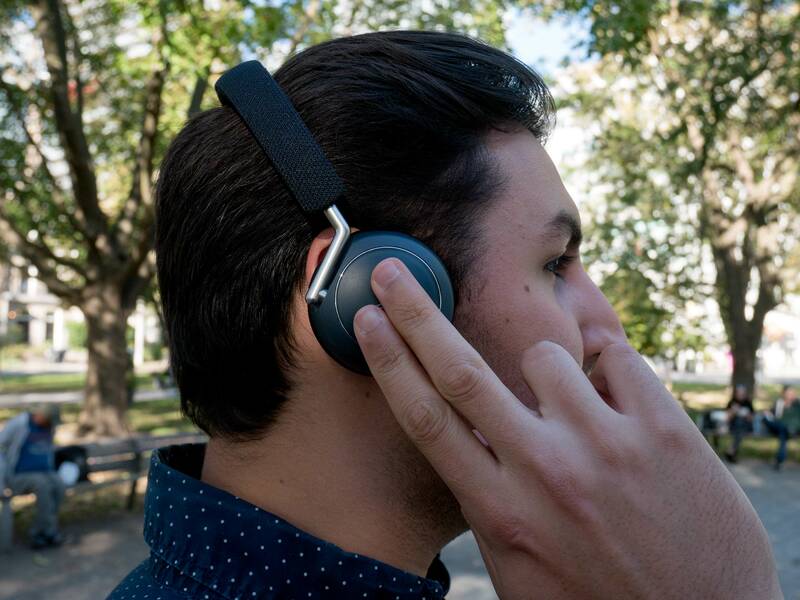 You can also cover the right earcup with your hands to temporarily disable the noise-cancelling feature; Libratone calls this the ‘Hush’ feature. Audio resumes normally once you’ve uncovered the earcup. The touch controls also work quite well though I found that the headphones sometimes failed to acknowledge that I’d tapped the right earcup with two fingers to pause or resume playing audio. The headphones come with a micro-USB cable charging cable, as well as a 3.5mm headphone cable to continue listening when the battery dies. Libratone insists that you can get 20 hours of battery out of these Q Adapt headphones, and that’s about consistent with my findings. The good news, dear reader, is that there really isn’t one. Turn on the headphones, plug them into a 3.5mm jack, and you still retain all of the playback controls — except for volume control for some strange reason — as if they were connected wirelessly. A word of note, however: the headphones didn’t work every single time I plugged them in. That is to say, the headphones wouldn’t always play audio if turned on and plugged into a headphone jack. Sometimes, I’d have to turn them on before plugging them in to get audio to play — sometimes I’d have to plug them in and then turn them on. The microphone also didn’t always work with the headphones plugged into an audio jack, so I think it’s safe to say that the full potential of the Libratone Q Adapt headphones isn’t unlocked unless they’re used via Bluetooth. There’s also an important reason why it’s better to listen to these headphones via Bluetooth: they support Qualcomm’s aptX HD Bluetooth audio standard. 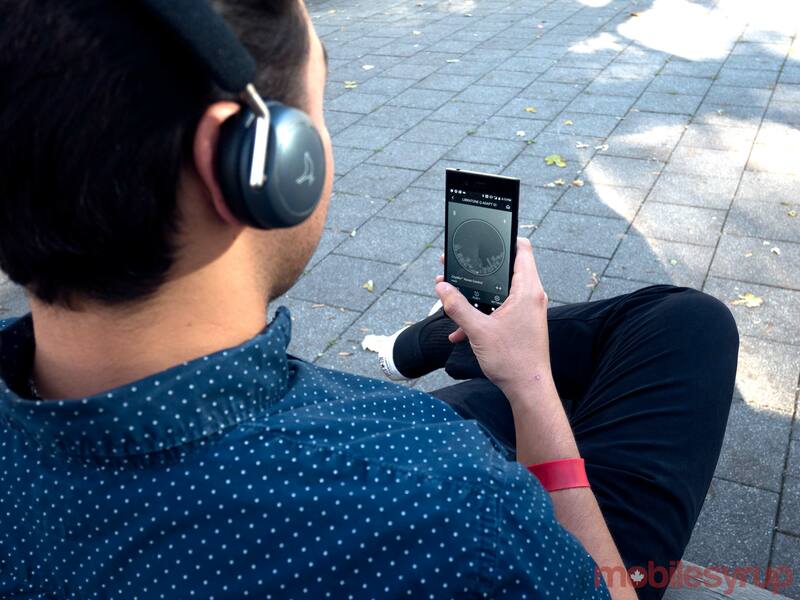 This means that you’ll get improved sound quality when the headphones are connected to an aptX HD-capable phone — like the Sony Xperia XZ1 or the LG V30. 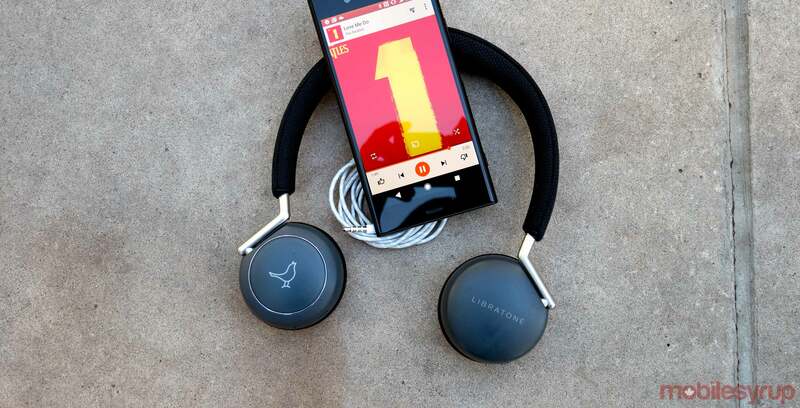 Logging into the Libratone app — available for free on Android and iOS — allows listeners to access a mobile interface for the headphones’ touch controls. You can also access expanded audio settings, and can even listen to a variety of regional, national and international radio stations directly within the app itself. However, beyond the expanded audio controls, the Libratone app is really just another music app vying for your attention. If you’ve got Apple Music or Google Play Music or Spotify, it doesn’t make a lot of sense to rely on the Libratone app. Still, it’s cool that the app allows you to compile and organize a list of radio stations typically spread across multiple websites and user interfaces into a single list. One final point of clarification: the Libratone app doesn’t tap into your phone’s FM radio. It simply streams radio stations over the internet. 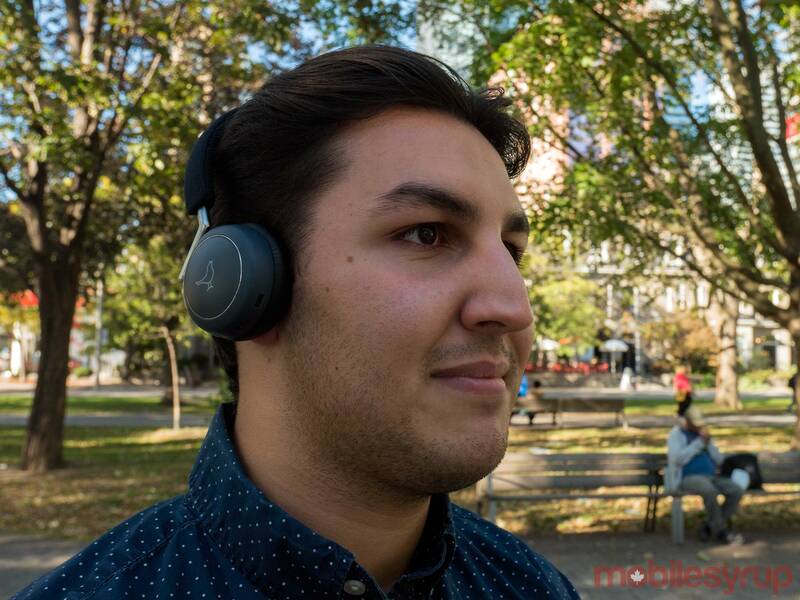 The Libratone Q Adapt headphones look great and they sound even better. Ultimately, however, whether you choose to purchase them depends entirely on your priorities as an audio-junkie -- as well as your commitment to wireless headphone technology. If you've got a phone without a headphone jack -- and let's be frank, that's becoming more common than I'd like to admit -- these are a great addition to your music collection. If, however, you'd rather risk audio quality for utility, and touch controls for in-line mic controls that often come standard with modern headphones, the Libratone Q Adapt headphones are not for you. 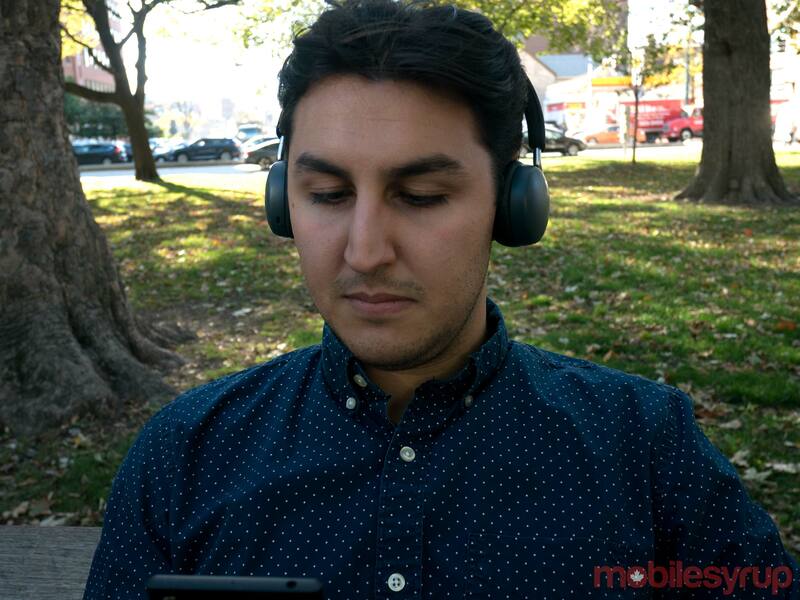 "The Libratone Q Adapt wireless headphones are great, so long as you're willing to brave Bluetooth."